The topic of dog vaccinations is a real can of worms. There are some good arguments for, but there are also good arguments against this practice. Common consensus opinion holds that vaccines are harmless. That wisdom is rarely questioned. In fact it is seen as a greater guarantee of good health, but is it really? People argue about it, doctors and vets argue about it and everyone has an opinion about it. Let's not fight! He doesn't look very happy about this, does he? He also doesn't have a choice, but YOU do! Have you ever considered the possibility that dog vaccinations do more harm than good? Some holistic veterinarians are saying that dog vaccines are the leading cause of other dog health problems. I fully understand and agree, that we must protect our dogs from serious disease, however, what is the trade off? What does your dog have to give up, what damage does he have to sustain, in order to be protected for life? Herein lies the condundrum! Is the potential damage greater than the potential benefit gained? All dogs, must be given the rabies vaccine. This is the law in all states and Canadian provinces. Anything else is NOT required by law. So please know this and make your decision understanding that you have the right to choose whether to give your dog the recommended ' core vaccines ' and others, or not. Puppy shots are given at varying intervals when the animal is young, and then yearly or every three years, after that. Over the course of your dog’s lifetime, that is a lot of vaccinations. What Exactly is In Dog Vaccinations? A little bit of the disease of course, which gives your dog a little bit of the disease to build up antibodies. So what's the big deal? Here's the problem. Most dogs are given ' vaccine cocktails ' which include the ' core vaccines '. In That Nasty Looking Needle? mercury - ethylmercury contained in Thimersol is used as a preservative against pathogens such as bacteria an fungus. This is where it gets realy dicey! My concern is for small dogs because the risk of side effects and potential danger increases exponentially. 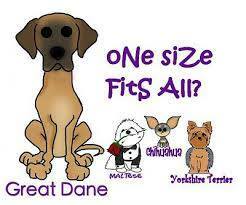 All dogs regardless of size receive the same amount of vaccine. So it doesn't matter if your dog weighs 6 lbs or 160 lbs, the dose is the same. 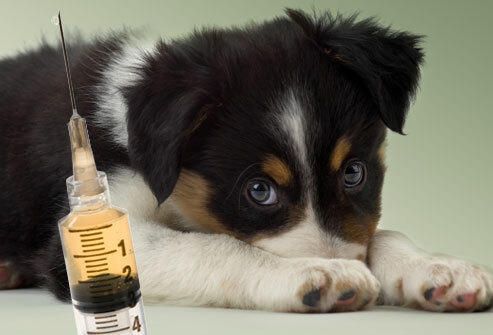 All dogs are required to get 1 ml of vaccine regardless of the size of the dog. Of course all of these things can be the result of other things, but if they occur within 72 hours to a week or two of dog vaccinations, I would be suspicious. Vaccine side effects are notoriously under reported, so the incidence of vaccine related illness is much higher than you might be aware of. It pays to do your homework on this topic. What is the Best Dog Vaccination Schedule? Originally, dog vaccinations were intended to do good. Over the last few decades animal vaccines have become a multi- billion dollar industry. This is now big business like any other. Veterinarians, although they have the best of intentions, have shared in the profits. What about annual re-vaccinations? What a great source of residual income. Nothing wrong with that but, to what detriment? More sick dogs? So now what? Although I cannot tell you to stop vaccinating your dog, it would seem wise to keep the use of dog vaccines to a bare minimum. The most up to date information available assures us that vaccine protection will last a minimum of 5 years and very likely longer. Here's a great page to help you decide upon an effective dog vaccination schedule. 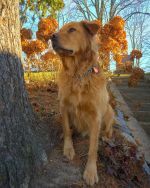 Strive for the best health you can give your dog naturally. You can boost your dog's immunity by providing the best dog food you can afford and use daily nutritional health supplements. Finally, search for a vet who will work with you to understand both the benefits and detriments of vaccinating your dog. You might have to do a little work to find one. The results will be worth it. I speak to many hundreds of people every month, and so I may have a different perspective on this vaccine conundrum. I hope it helps you make the best decision for your dog. 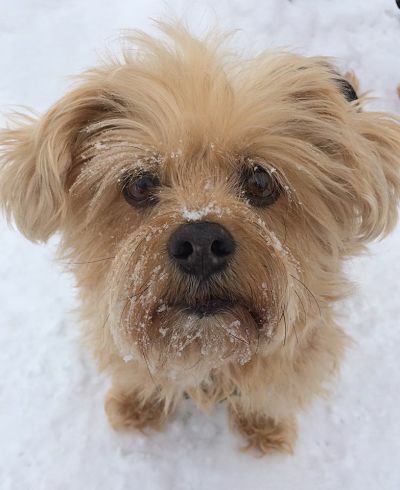 Small dogs are at higher risk. They get the same amount of vaccine as larger dogs. Really? A titer test is a blood test done to measure the existance of, and levels of antibodies to a disease. Antibodies are produced when a bacteria or virus causes the immune system to react. This immune system response can happen naturally when exposed to a disease, or when a vaccination has been administered. A titer test can help you know whether or not your dog is still adequately protected from disease by measuring the level of antibodies. If the percentage of antibodies is high enough, no vaccine is necessary. If the level is too low, you will know that vaccination is necessary. Titer testing prevents the dangers of over vaccination. Some vets will do in office titer testing and other will need to send the sample to a lab for testing. Therefore the cost will vary. Shop around. One titer test will be enough to let you know if your dog still has adequate antodies to ensure protection for life. You do not have to repeat titers. This should be a one time expense only. Unfortunately the rabies vaccine is required by law every three years and so titer testing would not be necessary. Maybe you can find another way to avoid repeating the vaccine.